I listened to the audiobook of Tempest on a very long drive from South Dakota to Washington at the beginning of the summer. I have to pause this review and tell you a funny story. I don’t know why but the audiobook narrator, Matthew Brown, put my cat to sleep. Marco loathed being in the car so he was crying like crazy. The meows were driving me insane so I finally turned on the audiobook. As soon as Matthew started talking the cat stopped crying and when it came time to switch discs he would start crying again until I put the next disc in. If I tried to listen to music more crying would ensue. So thanks Matthew for making my drive more bearable! The story of Tempest was interesting enough. Jackson can jump through time and everything is all fun and games until his girlfriend, Holly, is shot and Jackson ends up stuck in 2007. The story revolves around Jackson trying to jump back to 2009. It felt fresh to have a book written from a male perspective. I liked Jackson although at times his voice didn’t feel truly male to me. Jackson’s dialogue and thoughts could have been thought by anyone. There wasn’t that level of authenticity I look for from characters. That being said I did like Jackson’s steadfast loyalty to Holly. We see very little of Holly and Jackson’s relationship before Holly is shot and Jackson is sent to 2007. Instead their relationship is slowly revealed through flashbacks and we learn a lot about Holly’s personality from her 2007 self. I liked that the story was written this way because it made me want to root for both of the characters. Overall, Tempest had an original premise and likable characters. After I finished I couldn’t believe where Cross left the story. 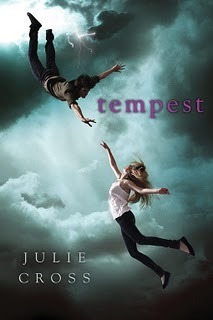 I had begun Tempest thinking it was a standalone novel and it ends on a bittersweet note. I have since found out it is a part of a series and whenever my TBR list gets a little more manageable I plan on picking up the sequel. What Goes Around Comes Around - Justin Timberlake- One of the most popular songs in 2007 Timberlakes song about things coming back oddly matches up with the time travel theme in Tempest. You Found Me - The Fray - A popular hit in 2009 this song reminded me of how Jackson felt when Holly was shot and the guilt he carried with him.